Print in which Adolphe Thiers is depicted with the body and head of a pear. 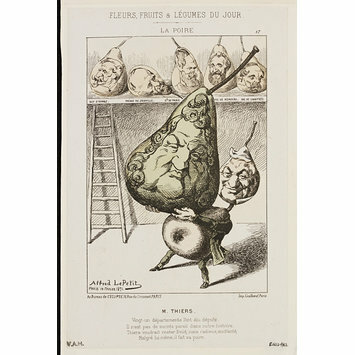 Thiers is holding a larger pear which has the face of Louis Philippe I, predecessor of Napoleon III. On the shelf in the background are various other pears with the faces of statesmen. Print from a set of caricatures, broadsheets and illustrations in ten volumes. Each volume is half-bound in red leather, gold tooled and stamped with imperial emblems, title etc. 'Le Poire'. 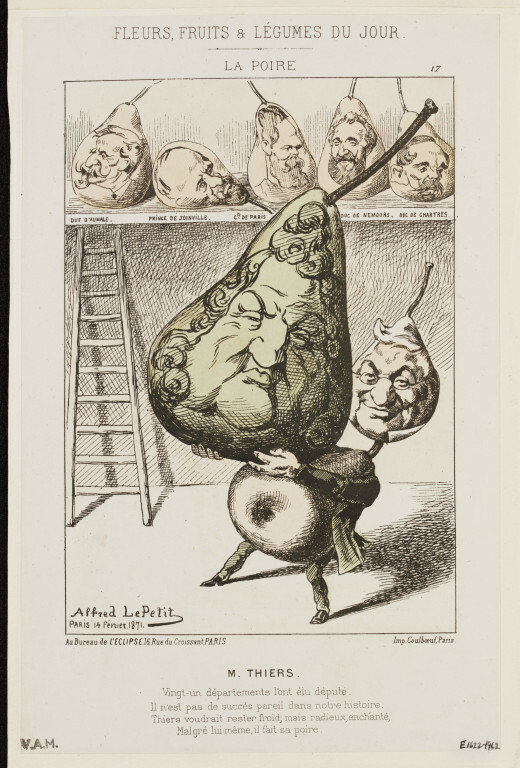 Satirical illustration by Alfred le Petit in which Adolphe Thiers is depicted with the body and head of a pea and holding a larger pear which has the face of Louis Philippe I. Hand-coloured lithograph, France, 1871.